True Stories tries to break journalistic storytelling out from behind the computer. Tuesday, May 15, 7:30 p.m. Between changing business models and attacks by politicians, journalism in the 21st century is nobody's idea of a smooth ride. Sometimes it requires a shift in thinking to see where it can go—even if that means re-imagining journalism as something that takes place on a stage, in front of an audience. This week marks the launch of True Stories, a first-time local showcase that attempts to turn journalistic storytelling into a multimedia event during a live stage show. Participants, including Salt Lake Tribune cartoonist Pat Bagley, Tribune freelance contributor Jennifer Dobner, radio producer/podcaster Andrea Smardon and investigative reporter Andrew Becker are scheduled to present original stories, sometimes accompanied by images, video, live music or even animation. 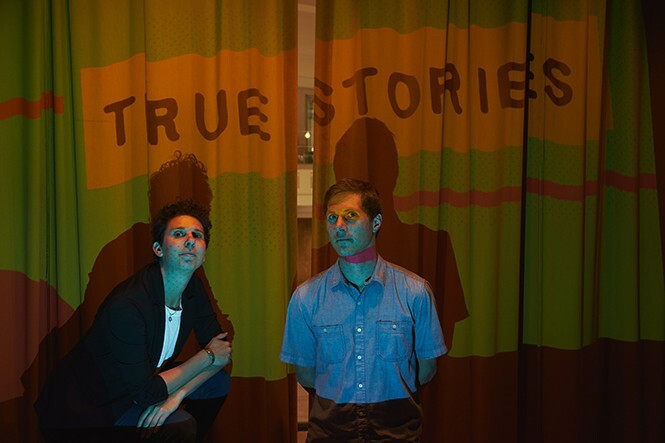 True Stories is the brainchild of photographer Kim Raff and KUER 90.1 FM writer/producer Erik Neumann, who met for the first time in 2017 when Neumann was newly relocated to Utah from Northern California. Neumann had been familiar with an event called Pop-Up Magazine from his time in the Bay Area, and felt there was an opportunity to present a similar kind of event in Salt Lake City. "The idea of Pop-Up Magazine is not our current sense of what a 'pop-up' event is," Neumann says, "but more like a magazine that comes to life in front of you. It's more dynamic, I think, and I found it really inspiring." After an initial conversation in which the two discussed the possibility for a similar local event. Raff began the process of applying for a grant, and when they received the funding, she jokingly recalls thinking, "Well, now we have no choice. We're doing it." While Neumann was able to get KUER to sponsor the event, Raff began using her contacts in the local journalism community to ask people if they were interested in participating. Ultimately, only one person that they approached said no. "We're working with people willing to challenge themselves," says Raff, who is also one of the presenters, as is Neumann. "It does take some convincing. This is way outside my comfort zone [as a photographer]. I could say, 'I'm doing it, so you should do it, too.'" "I think it is a really vulnerable experience for people who usually just sit in a room and work on their computer," Neumann says. "That vulnerability can be really powerful for an audience, when you're not seeing professional entertainers. It's a unique group of people to be in that venue." For Raff herself, she's finding the experience to be a unique challenge. "Writing is not something that comes naturally to me," she says, "so it's interesting the process of preparing the script for my story. ... To me, it's like taking storytelling to a whole other place. I'm getting to write and employ plenty of elements of multimedia in a way you couldn't in a magazine." That sense of being able to expand the conventional boundaries of journalistic storytelling is a huge part of True Stories' mission. Neumann notes that for most professional journalists, thinking about new ways of telling stories—incorporating social media or video—has practically become a job requirement. "Everyone in journalism is doing all sorts of mediums now," he says, "whether we like it or not. This show is conducive to that merging of mediums." "This is what journalism needs to be now," Raff adds. "There's that definition of insanity, about doing the same thing over and over and expecting a different result, and journalism is stuck in that holding pattern." Beyond the unique storytelling methods, there's also a hope that bringing these journalists out into the public eye makes them more than anonymous parts of a media machine. "We have all these podcasts like Serial where you hear the reporter going through their process," Neumann says, "so there's an appetite in the general public to see how it works. ... At its best, the audience is probably having a connection with the person up there, and that comes from the contributor really being passionate about the story they're telling, and wanting to share it with people." While there have been plenty of challenging logistics behind launching a first-time event—from finding the venue to coordinating all of the technical requirements for the evening—both Raff and Neumann express hope that this won't be a one-time-only situation. "I already have a rough list of people I'd want to ask for the next one," Raff says with a laugh. "You don't know if it will happen again. I think it's just this crazy experiment we're trying. We need to look at each other as allies, and think of ways we can help to make the community of journalism in Salt Lake City thrive."